Summer is here and if you’re like me, you can’t wait to get out of the city and finally enjoy some much-needed R&R. Of course, getting the green light to take a week (or two) off can be a challenge, which means the weekend rendezvous is much more practical. Unfortunately, like most vacations, weekend getaways can become quite stressful before they even begin—especially when it comes to packing. Word of the wise, it’s important to travel light. Remember you’re going away for the weekend, not traveling throughout all of Europe. To avoid that added stress and to guarantee that you spend an optimal amount of time in the sun, make sure to keep things simple- bring along one bag that you can just toss into your trunk. It will make your next trip that much easier. Just in case you’re not sure how to do it, here are a few tips to help get you sorted. When it comes to fitting enough clothes for a few days, the best options are either a duffel or weekender. Opting for a canvas-and-leather weekend bag like this Harwick Weekend Bag from J. Crew is perfect for fitting all your essentials. Of course, just like with every purchase you get what you pay for, so make sure you aren’t penny-pinching when it comes to the most important tool in your arsenal. Getting a decent bag from the get-go can help you save time and money in the long run. I know what you’re thinking. What on earth is a ‘Dopp Kit’? Well, essentially it is another bag just much smaller. Naturally, you have the bag that will carry your clothes; however, the dopp kit is a far more elegant solution to hold all your toiletries. We know how stressful it is to find things on vacation, so keeping everything together in a Dopp Kit is much more efficient. Plus, it looks more tasteful as apposed to hauling all your items in a Ziploc bag. If you’re all about having a matching set, you could opt for the Harwick Travel kit from J. Crew but a great alternative is the Leather Framed Travel Kit from Fossil. Of course to put your Dopp Kit to great use, you need to make sure you got all the necessary grooming needs. Fill it with all the basics of course (e.g. deodorant, soap, toothpaste, etc. ), but also think about bringing a great travel sized cologne, like the Versace Poure Homme Eau De Toilette. 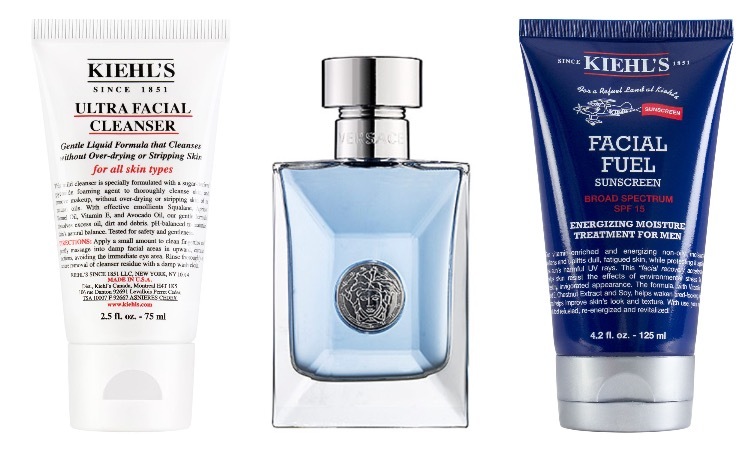 Not sure on which cologne to pack, check out our recent post about all the colognes women love on their men. Besides a fresh scent, make sure you slip in cleanser, such as the Ultra Facial Cleanser from Kiehls. Just because you’re on vacation, doesn’t mean you should hold back on grooming. In fact, you should be more careful if you’re going to be spending a lot of time in the great outdoors. Of course, these are all small easy-to-pack items that can help you freshen up quickly, especially after a long trip. Obviously, when it comes to traveling light, the goal is not to bring a lot. But this doesn’t mean you should wear the same outfit all weekend. The best way to optimize your weekend wardrobe is to pack clothes that can serve a double duty. For instance, bring a pair of mid-washed denim or some chinos that can easily transition from day to-night just from the switch of a shirt. Usually when I pack for a weekend getaway I make sure to bring along items that stick to a neutral color palette in order to ensure that all the pieces will compliment one another. Of course, depending on where you decide to travel to, your essentials will differ. For a getaway alongside the beach, taking some items such as: chino shorts, t-shirts, light button ups, sunglasses, and some canvas sneakers will suffice. 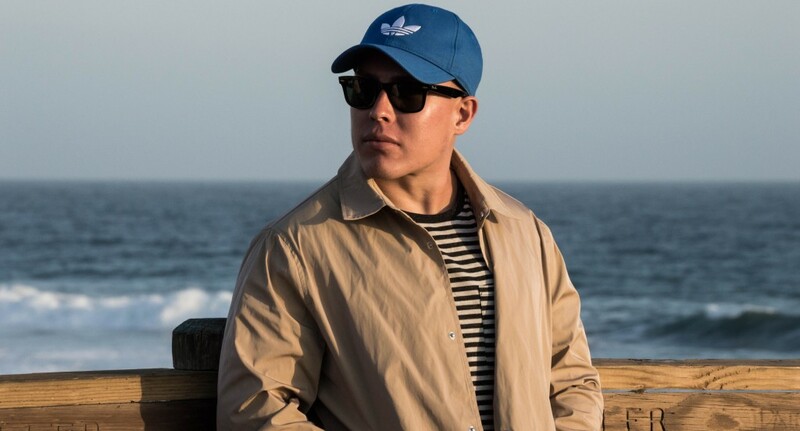 Apart from all your beach-wear necessities, such as your swimming trunks, flip-flops, and a hat (preferably a dad cap like this blue adidas cap) to keep the dreadful sun from beating down on you. While sticking to a neutral color palette is recommended, every outfit needs a little bit of pizazz, so let your hat be that piece. Hats are a great way to add splash of zest to your outfit without going over the top. Of course, to prepare for chilly nights, you should pack a light pullover like this coach jacket from ASOS. This jacket is light, stylish, and keeps me warm amid the chilly sea breeze. However, if you decide to take a couple’s getaway to wine country you might want to keep things more classic. Opting for some chinos, loafers, polos, and some linen button ups in a neutral color palette—blue, khaki, white, black—will keep things looking streamlined. Add a navy blazer into the mix, to make sure you look refined all weekend long. Remember, you’re going on a much-needed vacation, so don’t be scared to mix things up, from a style perspective. Try on a polo with a blazer, wear a blazer with shorts and sneakers. Usually don’t wear denim button ups? Pick one up and see how you like it. Let’s face it, you’re going to a place where for the most part no one knows you, so why not get a little adventurous? Now that you got all the basics for your next weekend rendezvous, all that’s left is for you to enjoy your trip. What are your weekend trip essentials? How do you do more with less? Let me know in the comments below!